Even people who routinely recycle might find it difficult to dispose of those things that can't be placed curbside, but they want to handle things responsibly. That's where Recyclepalooza comes in. Devin Davis, a student at Parker Junior High hands a bag of donated clothes to James Orr from Flossmoor. A few of the recycled items will be going to the Jones Canter in Chicago Heights. 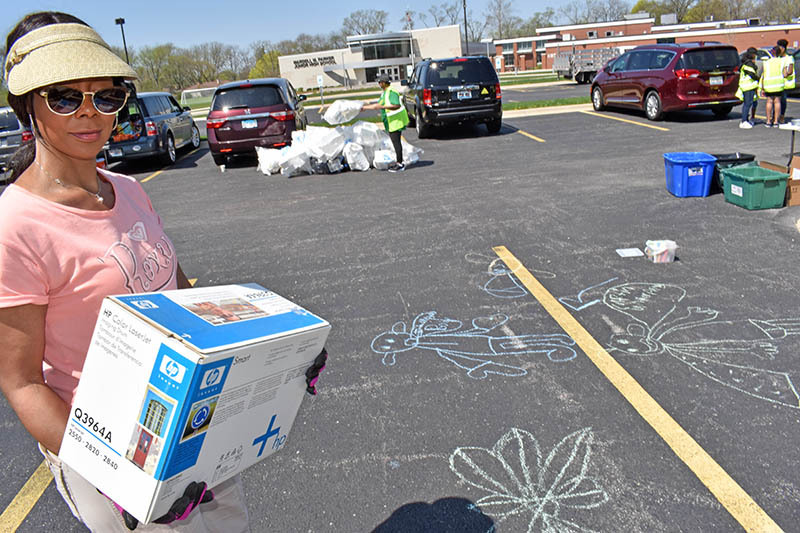 Cassandra Lickert of Flossmoor carries donated ink jet printers during Recyclepalooza. 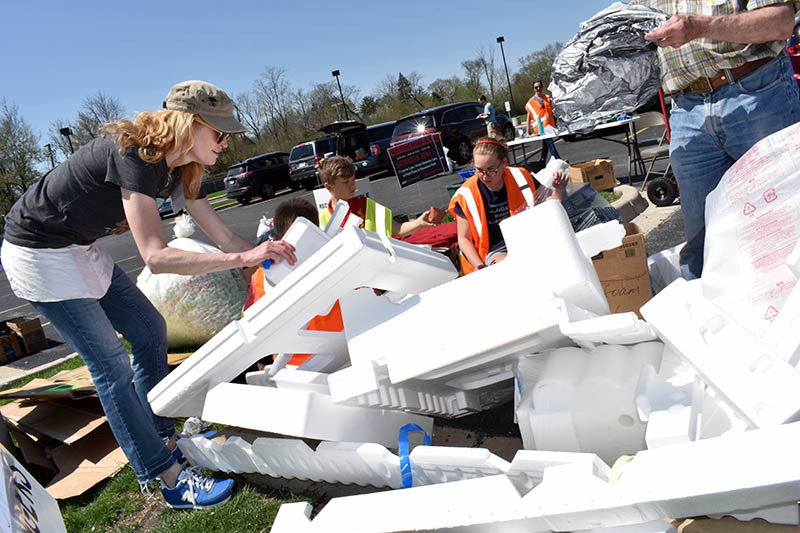 Carrie Malfeo, vice president of the Flossmoor Green Commission, organizes donations of Styrofoam. Larry Lickert of Flossmoor unloads the Elaine Kaufman's van of Recyclepalooza. 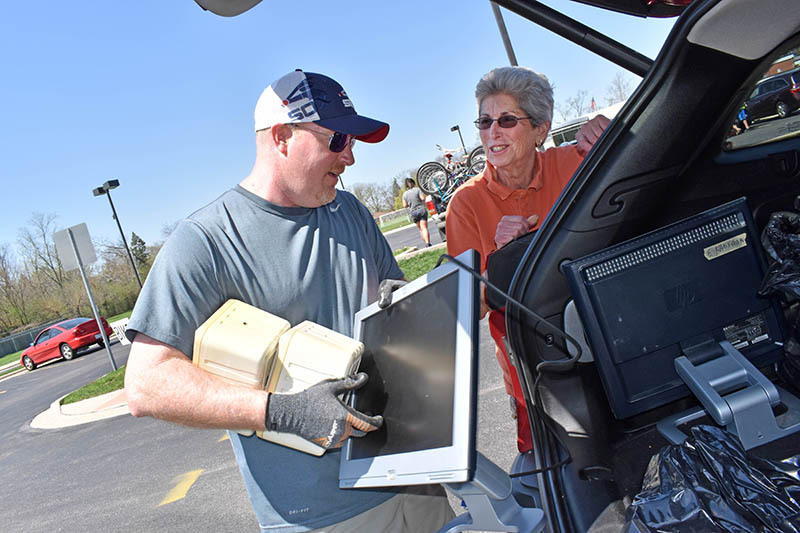 Aaron Gaby from Gaby Iron in Chicago Heights carries a computer from a car to be donated during Recyclepalooza. Carrie Malfeo carries a bag of donated clothes to a truck during Recyclepalooza. 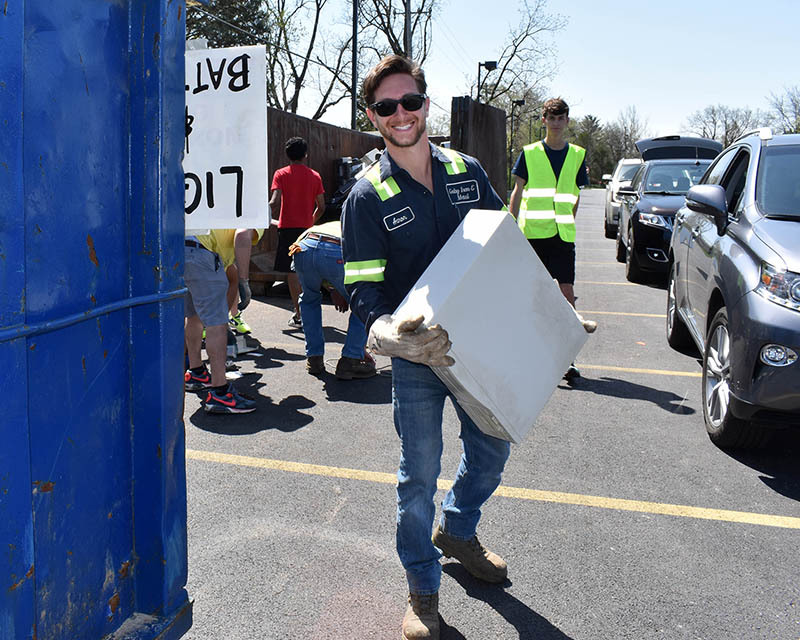 A steady stream of vehicles traversed the Parker Junior High School roadway during this year’s Recyclepalooza event, and it was good news for anyone who wants a greener planet. 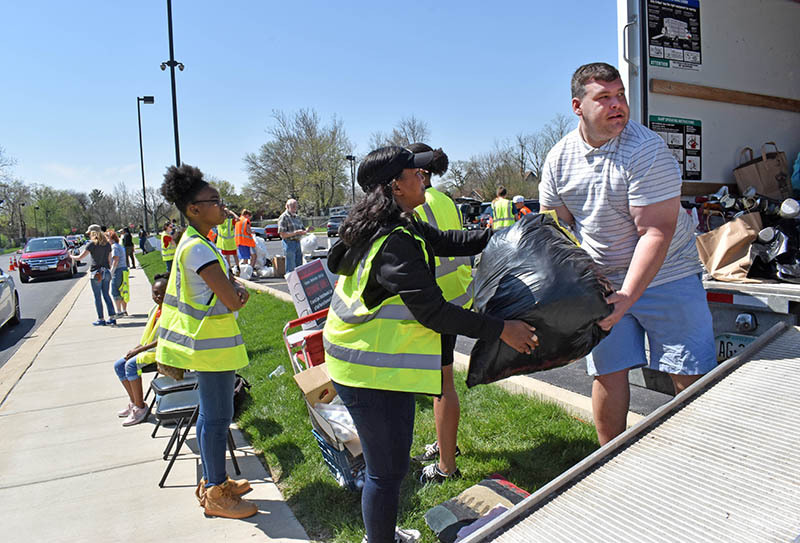 Tons of discarded household items were collected at the May 5 recycling festival, sponsored for the third year by the Flossmoor Green Commission. It’s been nearly 30 years since Homewood Disposal Service began curbside pickup of recyclables. Much has changed, but the community remains committed to this aspect of environmental stewardship. As the nation prepares for the annual Earth Day celebration on April 22, several programs in the Homewood-Flossmoor area are providing information and ways to celebrate special efforts to recognize how to be environmentally kind to the earth. The Flossmoor Public Library and the Flossmoor Green Commission are presenting two special programs dealing with the environment on Saturday, April 14, at the Flossmoor Public Library. The HF Area Green Committee is offering an easy way to dispose of Halloween pumpkins. Bring them to “Pumpkin Smash 2017” from 10 a.m. to 1 p.m. at Coyote Run Golf Course, 800 Kedzie Ave. in Flossmoor. Anyone who brings pumpkins will have a chance to toss them into a dumpster. They will be carted off to a landscape-waste recycling center in Peotone. Homewood officials announced this week that several popular services for residents are scheduled for coming weeks, including paper shredding, electronics recycling, prescription drug disposal and branch chipping. This week, yard signs are a vital part of local candidates' efforts to woo voters before the April 4 election. On April 5, those signs become trash. Maybe. One local environmentalist is offering to help candidates recycle yard signs instead of piling them into trash receptacles. Rep. Will Davis, D-Homewood, is hosting a program for shredding documents and recycling electronics on June 11. The program is for 9 a.m. to noon at Raday Lodge, 3220 145th St. in Midlothian. The program will have on-site shredding of documents that contain personal information, such as bank statements, old medical records, tax returns, pay stubs, bills and other personal documents. Participants are asked to remove all paper clips and other bindings. For the sixth straight year, Homewood and Flossmoor residents can recycle their holiday trees at Irons Oaks Environmental Learning Center. Trees can also be dropped off at Irons Oaks at any time between Dec. 26 and Jan. 18.